ST. SIMONS ISLAND, Ga. - Jan. 16, 2019 - PRLog -- Chase Busby, age 7, is a champion. For nearly half of his life, Chase has been in the race against cancer. This past October, Chase reached the finish line marking the end of his chemotherapy treatments at Wolfson Children's Hospital. "Chase is a remarkable boy and has shown so much courage," said Cassie Busby, Chase's mom. "He is our superhero and we are so grateful to have reached this milestone with him." This past November, Chase returned to Wolfson Children's Hospital, where he has received treatment for the past three years, for the removal of his chemotherapy port, a device implanted under the skin that makes infusions of medications easier on patients. Before it was removed, Chase had no memory of life without it. Following his port removal, nearly 100 people attended Chase's No More Chemo and Birthday Celebration at Village Creek Landing in St. Simons Island, Ga. To mark the end of his treatments, Dreams Come True of Jacksonville presented Chase with a "Last Chemo" trophy, and his first-grade friends at St. Simons Elementary celebrated with him at school. In January, Chase will be part of another race – the 10th annual Wolfson Children's Challenge, scheduled for Jan. 26, 2019, at The Baseball Grounds of Jacksonville. Chase is one of 55 children who will be celebrated at the event. The family-friendly fundraising event brings individuals and teams of runners together in honor of the tens of thousands of children who are cared for by Wolfson Children's Hospital each year. Cassie and her husband, Chris, immediately took Chase to the Emergency Care Center at Southeast Georgia Health System's Brunswick campus, where he was seen by emergency medicine physician Erin Compton, MD. Dr. Compton ordered tests that showed Chase's blood counts were dangerously low and his body was in septic shock. She recommended Chase be taken to Wolfson Children's Hospital in Jacksonville. The relationship between Southeast Georgia Health System and Wolfson Children's helped facilitate rapid coordination of care for Chase, who was transferred from Southeast Georgia Health System by the Kids Kare Mobile ICU to Wolfson Children's. Chase spent three days in Wolfson Children's pediatric intensive care unit (PICU) where doctors gave him a blood infusion and did further testing. "At Wolfson Children's Hospital, we learned there was a chance Chase had leukemia," said Chris Busby. "As a parent, you never think your child will have cancer. It was the scariest moment of our lives." "It certainly wasn't the news we wanted to hear," Chris Busby said. "However, we were relieved to have a diagnosis so Chase could begin treatment." Chase's treatment included chemotherapy given through a port and multiple hospitalizations after chemotherapy. It was challenging for Cassie and Chris to see their son go through treatment. "Through it all, Chase was brave and never afraid," Cassie Busby said. "He has been such an inspiration to us." "Everyone we met at Wolfson Children's Hospital was phenomenal," added Chris Busby. "The doctors and nurses were amazing and did everything they could to make Chase feel comfortable." 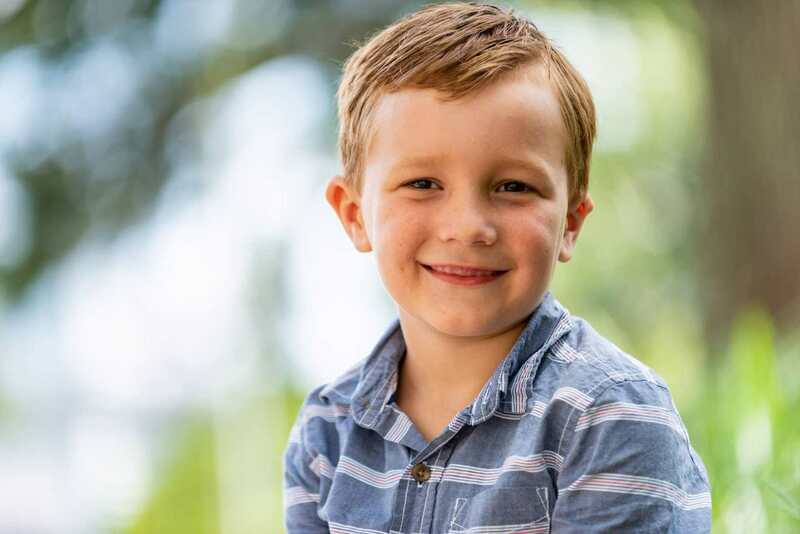 When the maintenance phase of treatment ended in October 2018, Chase had completed more than 1,100 days on chemotherapy, five bone marrow biopsies, 20 spinal taps, 67 IV pushes of chemotherapy, 70 complete blood count tests, and eight different chemotherapy drugs. Chase doesn't require any further treatment, but he will continue to have bloodwork every month for the next year at Wolfson Children's Hospital. "This is our family story and we are so grateful to be on the other side of the journey," Cassie Busby said. Chase will attend the Wolfson Children's Challenge on Jan. 26 with his parents, his sisters, Gracie Jane, 10, and Lily, 8, and other supporters. "Our local community has been incredibly supportive," Chris Busby said. "Wolfson Children's Hospital saved our son's life. We are so thankful to have Wolfson Children's Hospital within driving distance of our home." "Chris and I will always be grateful for Wolfson Children's Hospital," added Cassie Busby. "We are grateful that our doctors and nurses are some of the best in the Southeast and in the nation. I didn't realize how important it was to have a good children's hospital close by until our little boy needed it."